Winning smiles: The St Bredan's College Belmullet team celebrate winning the u19c National League title in Tallaght on Wednesday. Photo: SportsPress. Standout performances from MVP Sean Lavelle, Dara Lennon and Evan Ivers of St Brendan’s helped them into a 34-21 point lead going into the last quarter and it was thanks to this cushion that they were able to hold off a superb O’Carolan College comeback down the stretch to win. St Brendan’s had the better of the opening exchanges, with Sean Lavelle and Dara Lennon dominating on both ends of the court and reaping the rewards on the offensive end with some great scores. Adam O’Neill, Niall Bennett and Killian Price were on target for O’Carolan, but it was the Mayo team who held the lead 11-6 at the end of the first. An evenly-matched second quarter followed with the sides matching each other well at both ends, but St Brendan’s began to find their three point range, with Dylan Walker and Lavelle both hitting two well-taken three pointers to keep the Mayo team out in front. Good work from O’Carolan’s Laochra O Fionnagáin, O’Neill and Price though kept them in the mix, but the half time score was in favour of St Brendan’s, who held the lead 21-14. The third quarter was where St Brendan’s began to stamp some authority on the game. Good scores from Evan Ivers, Eoin McDonnell and Aran Reilly saw them widen the margin. 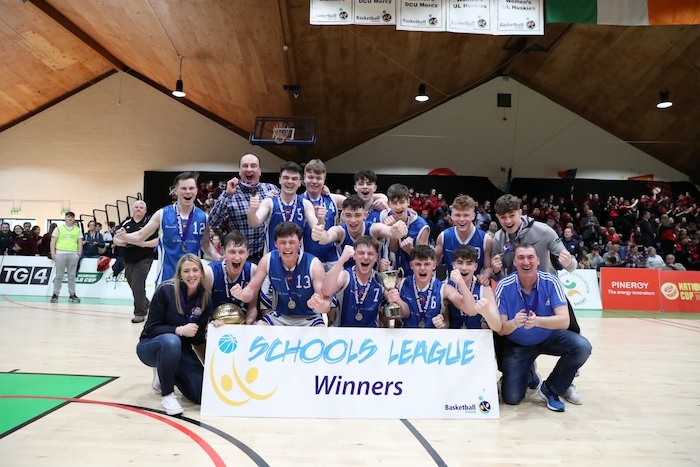 Despite a huge third quarter display from Adam O’Neill – who scored all of his side’s seven points in the quarter – Ivers was on hand to deliver a dagger three - and two further points from Walker saw St Brendan’s into a 34-21 point lead going into the last. The fourth quarter was all O’Carolan College’s though, with super performances from Adam O’Neill, Killian Markey and Daniel Murphy in particular. O’Neill bagged two huge three pointers and super defence from the Meath men saw it - with just over two minutes to play – back to a six point game. St Brendan’s rallied well though and two vital scores from Shane Togher and Eoin McDonnell was enough for see them home to a 38-30 point win in the end. O’Carolan College: Adam O’Neill (15 ), Daniel Murphy (2 ), Brian Reilly, Killian Price (6 ), Jonathan Reilly, Killian Markey (1 ), Philip McGovern, Ronan Byrne, Laochra O’Fionnagáin (5 ), Niall Bennett (2 ), Conor Owens, Eerik Piho, Ciarmhac O’Fionnagain, Diego DiFolco, Darragh Sheridan.